Veronika Reichl works as a filmmaker, writer, performer, and lecturer in Berlin. Since 2012 she holds seminars on performance and talks at University of Arts Berlin among other institutions. 2010 she realised a research project on imparting philosophy through visual media at the Oslo School of Architecture and Design. She received her PhD from the University of Portsmouth. Her doctoral thesis investigates in the relationship between linguistic and pictorial information and the nature of visual metaphors. Her book and DVD Sprachkino [Language Cinema] is about the interface between abstract language and images. It was published in 2008. Veronika Reichl did a Diploma in Graphic Design and a Master of Arts in European Media at Merz Akademie, Stuttgart. She was born in Baltimore, USA. 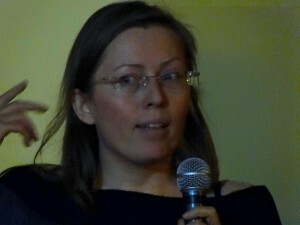 Veronika Reichl is particularly interested in the aesthetic experience of thinking, the threshold between thinking and feeling, thinking through images and through movements, performances and performative talks which centre around theory and ideas, and the interconnection between content and form in theoretical texts.